It started out as a normal Day for Leon and Parker. Leon was playing Ratchet and Clank Going Commando in the Living room while Parker was playing with his own collection of toy mecha. Just then, Nixie, the loving Unicorn care taker of the two baby dragons, approached Leon while he was engrossed by his game. “Leon, would you be a dear and turn that off?” She asked. Leon paused his game while looking at Nixie with disappointment in his eyes. “Why? Is it too loud?” Leon asked. “Oh no, no. It’s just I was going to take you and your brother somewhere today.” Nixie said. “Awww, do we have to?” Leon groaned. “Well, we could stay home, if you wanted to miss out on a trip to Elysium Aisle.” Nixie said. Leon’s ear fins perked up upon hearing that name before dropping his controller. Elysium Aisle was the name of a Bakery that had some of the most delicious sweets Leon had ever tasted, his favorite being their Oreo Cheesecake. The Mere thought of it caused him to drool slightly. Nixie was amazed by how quickly the little Dragon got up from his seat and switched off the TV and Playstation 2 before standing in front of her. “Well not yet, you’re not even fully dressed.” Nixie said, nudging his diaper. “Oh right, I’ll go get dressed.” Leon said. Leon started to head for the stairs leading up to the second floor before Nixie used her magic to grab him by the rim of his pelenka. “Don’t you need my help?” She asked. “Nope! I can do it myself.” Leon said, standing up straight in an attempt to look dignified, which was ruined by his poofy undergarments. “Well alright. Just call for me if you do need help.” Nixie said. Leon didn’t respond. 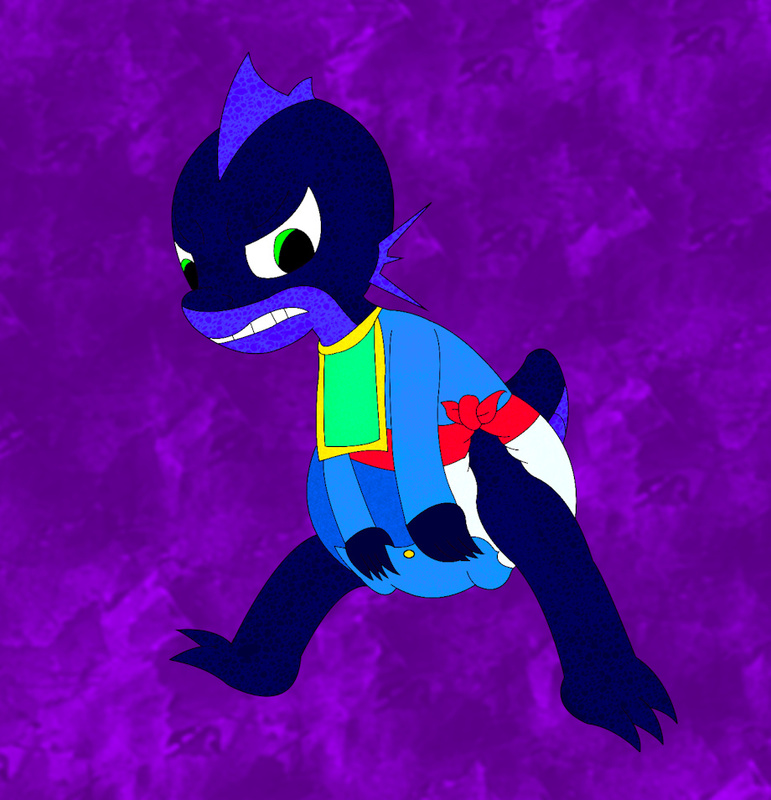 The second Nixie let go of his diaper, the baby dragon rushed upstairs. Nixie was amazed how fast he could run in such a thick garment. She shortly followed him upstairs to inform his brother of her plans. Leon closed the door to his room so he could focus on the task at hand. Going over to his big dresser, he pulled out the bottom drawer to use as a step so he could reach the top one which held his shirts. He looked around at all of the clothes until he settled on a sky blue onesie. Upon retrieving it, he also noticed a dressy bib hanging from the side of the dresser. Leon remembered that Nixie sometimes took him and Parker out for food on the way home and he frequently got crumbs and drink on his clothes. As such, he decided to take the bib to help prevent that. Stepping back onto the floor, he pulled the onesie over his head. Though he managed to get his head and arms in okay, he had a bit of a struggle getting his arms into the sleeves. After some struggle, he managed to get his arms through the sleeves and pulled his head through the neck hole. “Well, that wasn’t so hard.” He said, ignoring how much he was breathing from the effort. Unfortunately, Leon looked down and saw the flap of the onesie over the front of his diaper, the tail hole exposing it. “Whoops, on backwards.” He said. Pulling his arms back into the interior, Leon pushed the Onesie upward, pulling his head out of the neck hole and proceeded to turn the whole onesie around, the fabric brushing hard against his scales. He reached his arms into the sleeves once more and pulled his head out of the neck hole, gasping for air. After catching his breath, Leon adjusted the back of his onesie so his short tail popped out of the tail hole in the rear. Bending over, he grabbed the bib that he dropped on the floor and held it up against his neck. Pulling the strings behind he neck, he began fidgeting with them in numerous patterns, trying to get one that would hold it in place. He managed to get it into a knot that held it on loosely. He couldn’t get it unstuck, but he could have Nixie help him with that later. “Alright, just a snap up and we’re good.” He said. Leon bent over and reached between his legs. He felt around for the fabric of the onesie flap, but all he could feel was the soft absorbent material of his diaper. He bent down even lower so his arms could go further back. However, this caused the little dragon to lose his balance and fall forward, bonking his snout on the floor. Sneering in anger, Leon propped up his legs, lifting his rump in the air. He once again reached between his legs to grab the flap of the onesie. He just barely grabbed the rim of it with his middle finger, only for it to slip from his grasp. The Little dragon growled before flopping back on his belly and rolling on his back. Hunching his torso forward, Leon once again reached between his legs to grab the flap. Over the bulk of his diaper, he finally managed to seize it. Smiling proudly, he held tightly onto the flap between his legs as he sat up and got to his feet, still hunched over. He began to pull the flap up to the rim of the onesie, where the snap points were located. However, he soon ran into more frustration when he couldn’t get the flap to reach it. It was most likely because of the huge mass that was his diaper. He grunted as he pulled harder, but the flap wouldn’t reach the snap points. The Frustration soon became too much and Leon began to growl. Meanwhile, Nixie was assisting Parker in getting dressed, since he didn’t offer to dress himself. Normally Parker would wear a Onesie or overalls. Today however, Nixie decided to try something new. She got both of her babies little sky blue sailor shirts, complete with neck ties. Parker held his arms straight out to his sides as Nixie tied the neck scarf on. Parker wasn’t used to wearing a bizarre item such as a sailor shirt, since it was fastened with buttons and he wasn’t used to clothes that had buttons around the belly. “This feels weird.” He said. “Well if it doesn’t work out, honey, then I won’t make you wear it again. I just thought you would look so adorable in it.” Nixie said. Just then, both of them heard a loud, angry scream in the adjacent room, which startled them both and caused Parker to fall on his padded rump, causing baby powder to puff out of the leg holes. “Oh my, I wonder what’s gotten into Leon.” Nixie wondered. Using her magic, she lifted Parker up and plunked him on her back before trotting over to Leon’s room. Opening the door, she was greeted to the rather silly sight of Leon, on his back, desperately trying to close his onesie while screaming in anger. Parker covered his mouth to stifle his giggling at the sight. Nixie briefly glared at him before returning her gaze to Leon. “Leon, dear, you must calm down!” Nixie said. Nixie used her magic to bring Leon closer to her and set him on his feet. Unfortunately, doing so caused him to lose grip on his onesie flap. He stomped his foot in anger. “Now Leon, it’s not good to get so angry.” Nixie said, stroking Leon’s back with her hoof. “But I was so close! I just had to snap it shut but it wouldn’t do it.” Leon pouted. Examining his wardrobe, Nixie used her magic to stretch the flap down under Leon’s legs before managing to pull it over his diaper and snap it closed. However, it was still under a lot of stress. “Hmm, this onesie must have shrunk in the wash. Maybe we should find you something else to wear.” She said. “No! I don’t wanna get dressed again!” Leon whined. “Well, this might snap undone. That is, unless...” Nixie trailed off. Nixie went over to the dresser that held Leon’s diapers. She pulled out two safety pins from the top drawer and fastened them on his onesie flap. “There, that should stop it from coming undone.” She said. “Can we go now?” Parker asked impatiently. “Yes, yes. I know you two want your sweets. Let’s be on our way then.” Nixie replied. Nixie trotted off with Parker on her back, while Leon followed by her side. Though he was thrilled to be getting some delicious Oreo Cheesecake, he was still disappointed that he couldn’t do something as simple as button a onesie.